At the age of 82 Leonard Cohen is releasing an album of haunting new songs, which the lucky few who have heard it, deem “a masterpiece” and “classic Cohen”. The album is called YOU WANT IT DARKER and arrives in stores this Fall. Last edited by danslenoir on Fri Aug 12, 2016 2:14 pm, edited 1 time in total. Very good to have news - especially this. jerry wrote: The cover is similar to Songs From A Room. Yes , sort of . I notice he has a cigarette in his hand , but hope he hasn't started smoking again. When I heard the title, I heard the title I had an ominous feeling that it might be Leonard's "Blackstar", but I see that "You Want it Darker" is the name of the opening track. Seems all you have to do around here is ask and you will receive Jarkko's new "P" word and has come to fruition quicker than I thought! Interesting that the new album was produced by Adam. And I’ll bet that Alex plays his violin on it especially taking note of the last song. I reckon those lucky ones in Amsterdam will get to hear the album - good for them! Leonard Cohen, acclaimed composer of “Hallelujah,” at the age of 82, is releasing an album of haunting new songs, which the lucky few who have heard it, deem “a masterpiece” and “classic Cohen.” The album is called YOU WANT IT DARKER and arrives in stores this Fall. As Leonard’s record company for over five decades, Sony Music is proud to be associated with this remarkable achievement. This great artist continues to astonish us. 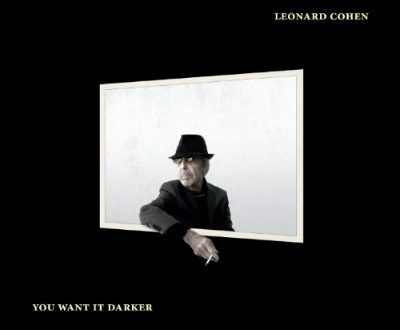 Uncompromising and urgent, YOU WANT IT DARKER is the latest chapter in Leonard’s significant contribution to contemporary music and thought. These startling songs have been beautifully realized in this, his 14th and most compelling studio album, produced by his son, Adam Cohen. Still more P atience needed. First for details of the release date . Then for the release date to arrive.